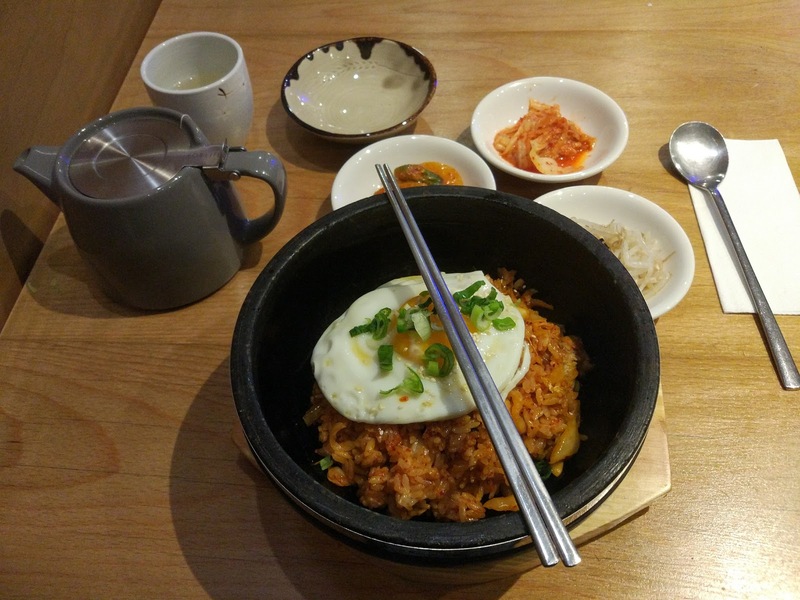 Adventure with John: New Malden, K-town, London - Korean Food Galore! 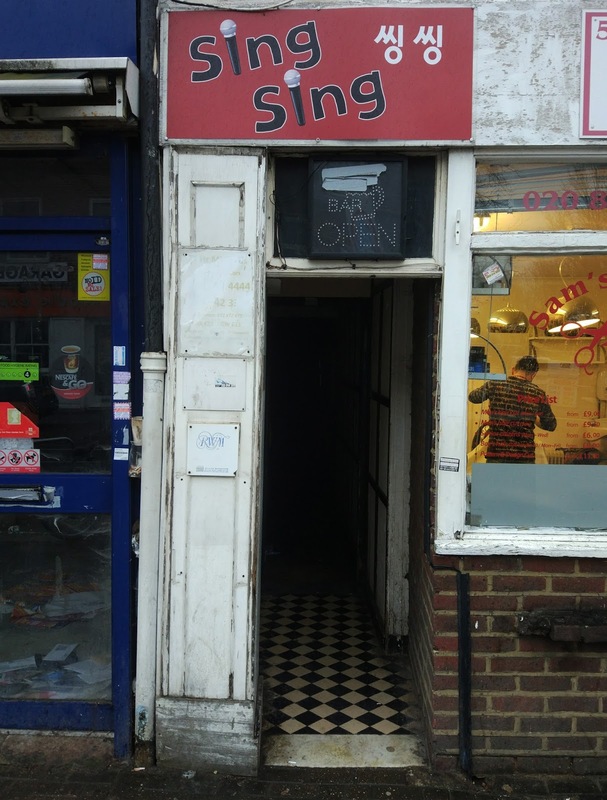 New Malden, K-town, London - Korean Food Galore! At careless glance, New Malden looks like a pleasant suburb on the South Western fringe of London. Red Brick turn-of-the 20th century flats and shops along the high street don't jar too incongruously with the one or two more modern blocks that have inevitably begun to pop up with London's relentless expansion. The station, which connects to Waterloo and Vauxhall in central London, confirms its Victorian origins. 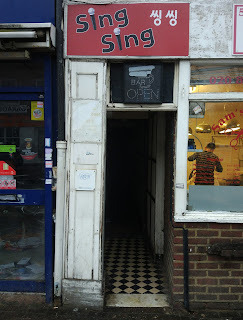 And if you exit the station onto the high street, you might overlook a snack-shop at the end of the tunnel. But if it's around lunch or dinner time and you're in need of nourishment, you might pause for a second and look at the food on offer. And New Malden's wonderful secret will be betrayed! 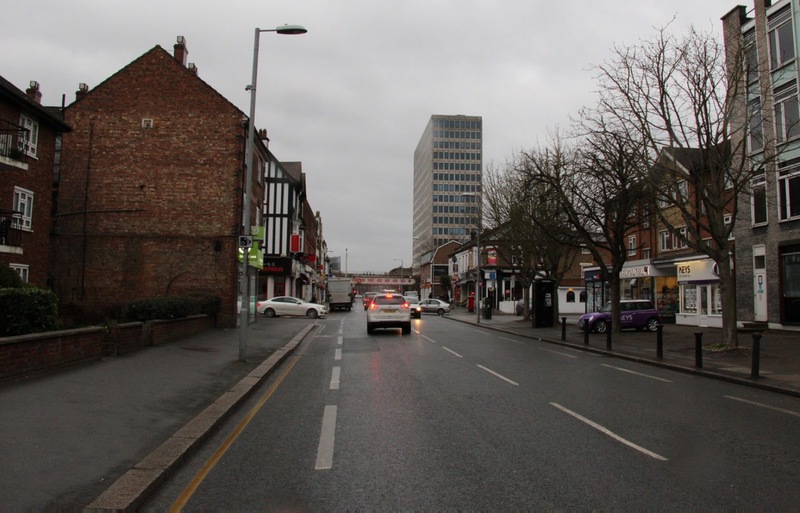 New Malden is also known as K-town, Koreatown and the People's Republic of New Malden. Its home to a population of around 10,000 ethnic Koreans, numerous Korean restaurants, shops and beauty salons, and it's here that you should come for the best Korean food in the UK. The station is located at the beginning of the High Street heading South and Coombe Road heading North. There are Korean restaurants in both directions and on both sides of the road. To the lover of Korean cuisine this may seem like paradise, but there are only so many meals you can eat in a day, and your wallet only contains so much money, so choosing a place to eat is tough. Going by price could help you decide, as the same dish seems to have a different price in different restaurants. However don't expect to pay Korean prices, and even by English standards eating out in New Malden is not very cheap. I thought I would be able to make my decision about where to eat based on the number of Korean customers, but most of the restaurants were completely full of Koreans - a good sign of quality but it didn't make my decision any easier. In the end I chose Hamgipak (함지박) as it was the most Korean-looking restaurant I've ever seen outside Korea. 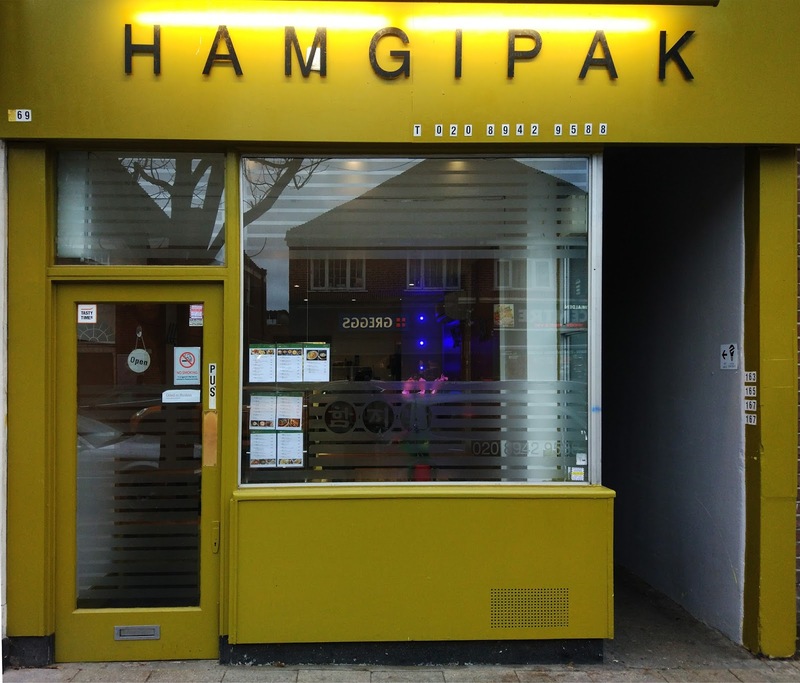 Hamgipak is located on the High street, on the right hand side coming from the train station. Eating here was like travelling to Korea. Just like in Korea, if you order a main dish you get free side dishes called banchan(반찬). These were kimchi, bean-sprouts and a dish that seemed like a very reasonable anglicisation of muchorim(무조림) made with potato instead of mu(무)aka mooli or daikon. I made sure to verify with the restaurant lady that the Kimchi was homemade (it's just not the same out of a packet) and answering in the affirmative she offered to sell me some to take away! The dish that came that the banchan came with, was Dolsot Bibimbap (돌솥비빔밥). Served in a searing stone bowl for £8, it's a rice dish mixed with chilli sauce, kimchi and fried egg. Despite it being slightly less spicy than I expected, it was nonetheless almost identical to the Korean version. I looked on the drinks menu, and unable to find soju(소주), I chose Oksusu cha(옥수수차), maize tea for £2. Halfway through my meal a group of Korean men came in, Korean style, and almost immediately they had the characteristic soju shot glasses brought out and seconds later a bottle of Korea's favourite booze was produced. Clearly an off-the-menu item, you can still get it for £10. Overall Hamgipak was truly an excellent restaurant in all senses of the word, and I would recommend it to anyone who wants to discover Korean food, or who like me wanted a bit of a reminisce without disappointment and maximum enjoyment. However there are plenty of other restaurants in New Malden that I'm sure meet these standards, and look forward to trying another soon! There are other authentic Korean things to do besides eating. In Asian circles Korea is famed for it's make-up and beauty industry and you can get all this kind of treatment here at the numerous hairdressers/beauty salons along the High Street. I also found a karaoke bar which emanated a mysterious hint of sordidity that only a Noraebang(노래방) can exude. The weekend I was there I happened to stumble across a Steampunk market in the Christchurch on Coombe Road. On the surface New Malden is a standard suburban town, but beneath its Englishness is a diverse and sometimes quirky reality that makes it more than worth visiting on a rainy day.